Saturday mornings are for multiple cups of coffee and leisurely breakfasts: fluffy pancakes or a frittata, or — most often — a batch of waffles. During the fall, we prefer our waffles with pumpkin puree, pecans, and a variety of aromatic spices. And during the summer, they’re topped simply with local berries, maple syrup, and a shake of powdered sugar. But sometimes our Saturdays get a little fancy. 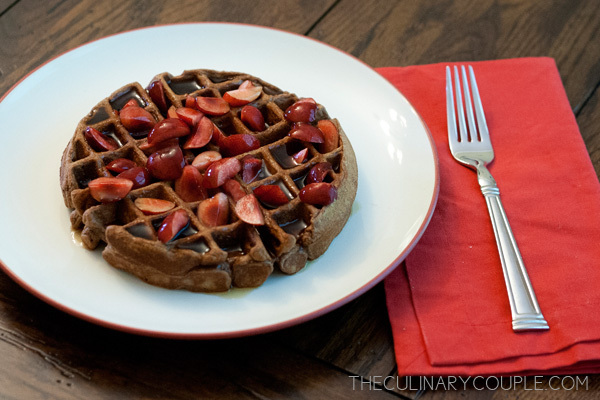 These waffles are slightly sweet with just a hint of chocolate, and hearty, thanks to the combination of rye flour and Greek yogurt. Top them with red cherries or golden raspberries, and say “hello” to a happy weekend! Meanwhile, whisk together rye flour, all-purpose flour, sugar, cocoa powder, baking powder, and baking soda in a medium bowl. Pour the batter into the waffle iron and cook until slightly crispy. Top with cherries or berries and maple syrup.